Cambridge offers a wide variety of 5K road races to choose from. You can run down Mass Ave or Broadway for some races. For others you can run the paths along The Charles River. Cambridge 5K races start in February and run into December. Many are large events which attract a young crowd and have great parties afterwards. Please check race web sites for dates as some races have not posted 2019 dates yet. I update this post often, but sometimes dates change between updates. And sometimes a race gets cancelled. Click any race name to go to that race web site. The Super Sunday races are the first races of the year and draw about 2,000 runners. I’ve run the 5K in freezing cold and I ran the 5 Miler in above freezing temps. You never know what you will get, but you will have a good time. This well-organized running event features hot food and a huge beer garden. They always have a dozen or so local breweries on hand to get the party rolling and keep it going into the early afternoon. Proceeds benefit the RACE Cancer Foundation. Leave the keys and the kids at home. The Kendall/MIT red line station is right around the corner from the race area. This race take place off of Mass Ave on Sidney Street. This is a large race with a great post race party. Public transportation is a good idea, keys and kids are optional. I’ve run this race several times and it is always a good time. It’s great to see the fast runners and hang out with friends, old and new, at the apre race party. This is a flat course and over a mile of the race is run down Mass Ave. Total elevation gain for this Cambridge 5K is 30 feet. Get 19 of your friends to form a team and get a VIP tent complete with cold beer. The tent comes with a table and they are close to the music and pouring stations. Plus they make a great place to stow your gear and hang out with your friends. This race has been cancelled and replaced by a half-marathon and 5 mile race on March 10th in Malden. 2019 will be the 33rd running of this race. Managed by Friends of Cambridge Athletics, this returns to Fresh Pond in 2019 from Danehy Park last year. I ran this race when it was a 5 mile race in 2015. My recap from 2015. Parking is available at the Tobin School, 197 Vassal Lane. NO parking at Fresh Pond, and they will ticket! Registration is $35 for adults and $25 for students. Race day registration is $40 adult and $30 student. Students 18 and under can register for FREE. The Bionic5K celebrates hope over despair, diversity over uniformity, possibilities over disabilities. Join us for this inclusive 5K race in Harvard Square, Cambridge, Massachusetts. The Bionic5K recognizes the resilience and tenacity of disabled athletes while celebrating advances in science and technology that are ushering in a new bionic age. Whether you are running with a prosthetic, an artificial hip, an upgraded knee, an Apple Watch or a fitbit, join us. All are welcome: disabled runners, able-bodied runners, walkers, scientists, technologists, students, teachers, kids and parents. All proceeds will benefit the Bionic Project Inc, a non-profit whose mission is to help advance new prosthetic technologies and to broaden the access to resources that promote active lifestyles and athletics for those who must overcome physical challenges. There is a bag check and public transportation is encouraged. After party features Mystic Brewery and Shacksbury Cider. Registration is open and is $40 for adults or $25 for 18 and under. May TBD, 2019 – 9:00 AM Cancelled? Danehy Park @ 99 Sherman Street. Gawad Kalinga would like to invite you to the 11th running of the GK 5K Run to Build. Enjoy our 5K timed run and walk, then finish off with a FREE meal and drink for all runners and walkers! Our mission is to build homes for the homeless in the Philippines. Registration is not open yet. A date has not been posted yet. If you work in Cambridge or Boston, these Marathon Sports/BAEvents make great after work races. Recruit some friends or get together an office or company team to enjoy the summer running season! A finisher’s medal is not offered at this race. If your company team has first time 5K runners make it a night they will never forget with a 5K medal! It’s a great way to build comradery on your team! This race is run out of the CambridgeSide Galleria and is part of the Cambridgeside Charity Race Series. Registration is open and is $37 through March 31st. A short sleeve technical t-shirt just in time for the warmer weather. 5 free parking passes for CambridgeSide. You can park for free on race day and 4 MORE TIMES! Come back and shop, eat or both! VIP perks for teams over 20, including a semi-private area for celebrating, snacking and hydrating together. 3 drink tickets for use at our post-race celebration. Participants 21+ can enjoy 3 beverages provided by Cambridge Brewing Company. Part of the Cambridge Classic Series, this race was introduced in 2016. This race encourages teams and since it is on a Thursday night, it’s a great way to get together with friends and colleagues! If you don’t have a team join Team Melrose Running Club. We always have a great time at our table with runners from all over invited to join the team. This has become a very popular race and always sells out. So get your friends together now. These races are all children and car-key optional. Registration is open and is $35 until March 31st. This is a fun mid-week race if you work in Boston or Cambridge. A great party with food, beer and band after the race along The Charles River. 577 runners finished this race in 2018. If your company team has first time 5K runners have a special awards ceremony after the race. They will be excited to receive a medal and everyone will have a great time! This race and walk raise funds to support ALS research. The race is held in Technology Square and features a 5K run, 4 mile walk and wheelchair ride. All proceeds benefit the ALS Therapy Development Institute. Fundraising is encouraged, but not required. This is a nice run through East Cambridge with several small hills. Course map HERE. This is a remarkably small race for Cambridge with only 184 finishers in 2018. If you are looking for a nice race for your kids, this is it. Nerdy costumes are encouraged. Finisher’s medals are not provided. 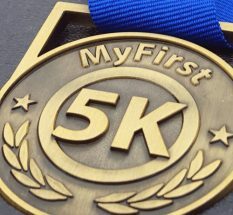 If your company team has first time 5K runners have a special awards ceremony at your tent with the My First 5K medal! They will be excited to receive a medal and everyone will have a great time! Get Yer Ya Ya’s 5K is the fifth of five races in the “Let’s Run, Have Some Fun & Be Fit Series”. These races take place on Thursday nights and are a great way to get together with friends after work. Surprise your first time runner with a medal at the finish line! If your company team has first time 5K runners make it a special night for them with a 5K medal! Brought to you by the same folks who brought you the Cambridge Summer Classic. This race takes place at the same location and runs the same course. This is another large Cambridge race with a fast, young crowd that runs hard and stays until the beer is gone. Kids and keys are optional. The Kendal/MIT station is a short walk from this event. This 5K race takes place at Paddy’s at 260 Walden Street in Cambridge. Proceeds benefit The Cambridge Girls Softball and Title IX Girls Running club. The race starts at 10AM and the street party in front of Paddy’s goes until 6PM. Registration is not open but was $30 for the 5K, $20 for 17 and under for 2018. Sponsored by the CambridgeSide Gallaria and benefiting the Cambridge Family & Children’s Service. This German-themed 5K race takes place in Kendall Square. Growing from about 1,000 runners in 2011 to over 2,250 in 2015, this is a casual, party themed race which draws a young crowd. Bring your Lederhosen and leave the kids and keys at home! CF5K is a race with fun for the entire family. Hosted by Cambridge Friends School, this race includes a Kids Fun Run followed by a 5k run/walk that will be professionally chip timed by RaceWire. Guaranteed tech shirts to all participants pre-registered by September 19, 2019, prizes to top finishers, and post-race festivities for all! Registration is open and is $10 for kids fun run, $20 for the 5K through September 6th and then $25 through October 8th. Get a team of 14 of your friends and get a VIP tent! This race also encourages teams and gives prizes for the largest team etc. These races are always fun, party races, regardless of the weather. Bring extra clothes, leave the kids and keys at home. November 2019 – May return in 2019! The Cambridge Half debuted in 2016 and had a second running in 2017. The race was cancelled due to permitting issues in 2018 and for good in 2019. It is a challenge to close down many roads on a Sunday morning for hours. In 2017 a lot of the course was run on the paths along The Charles River, but alas that was not enough to save our race. Based out of the Cambridge Side Galleria, the Cambridge Half was a big hit with local runners. Apparently not such a big hit with the Cambridge permitting authorities. Brought to you by the folks who put on the Cambridge Classic Series. This race had 986 finishers in 2018, it was a cold and damp day for a race. Bring some extra clothes and leave the kids and keys at home! The Kendal/MIT station is just a short walk from the party. 2019 registration is not open yet. This race does not provide a finisher’s medal. If your company team has first time 5K runners or you are trying to recruit non-runners to join your team the medal could be just what you are looking for. Who doesn’t love a medal and the bragging rights that go with it? You can have a special awards ceremony at your tent after the race! The last Cambridge 5K of the year. 10 days before Christmas, this race takes place in Harvard Square. This course is USATF certified (#MA11901JK). Registration includes a high quality knit hat, food and beer. Women make up about 60% of the runners and most runners are there for the fun. 3,131 runners completed this race in 2018. We have seen several Cambridge 5K races and The Cambridge Half Marathon disappear. It is unfortunate and sad. I’ve run some of these races and enjoyed them. As runners we need to be good guests and be respectful of the people who live in the neighborhoods that we run through. When only one side of a road is open to runners, we need to let traffic use the other side of the road. We are guests and we are inconveniencing people so we can have our fun. We also have to keep in mind that most people think we are crazy to be out running in the first place. I don’t know what the answer is, but there has to be a way to co-exist with the city while we have our fun. If you have ideas on where races could be staged or how we could be less of a nuisance to the citizens of Cambridge, please reply to this blog with your ideas. Run well my Friends, and see you in Cambridge!